The hazy view along Palestine Road N.W. Monday afternoon. Wondering where all that smoke came from about mid-day Monday? 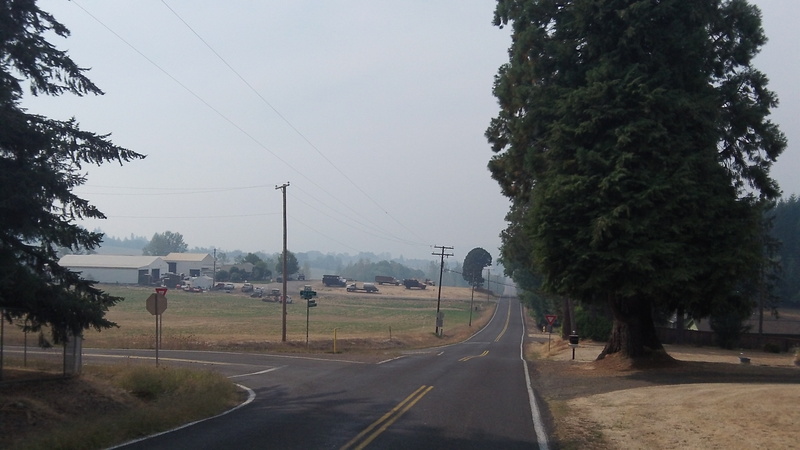 The Oregon Department of Environmental Quality says it came from a 2,300-acre wildfire near Estacada. Albany and Corvallis were among the places where the smoke was heaviest, according to a DEQ air quality map available online. The DEQ was full of advice for what to do “during wildfire smoke events.” Among other things: “Be aware of smoke concentrations in your area and avoid the places with highest concentrations.” It’s good that we have someone to look after us. The DEQ also says to stay indoors and avoid heavy exercise. So, evidently it would be a bad idea to hop on a bike and go up a bunch of steep hills. Was Pre running that fast to get out of the smoke?